I’ll tell you more about Eve in a moment. But first I want to show you how you can serve as a miracle for Eve and other Orthodox orphans at the Bethany school for girls. You have an exceptional opportunity to help turn things around – one Orthodox child’s broken life at a time. How? By getting them… a van. But good news first: there’s a donor in the Holy Land who promised to match every dollar of the first $25K we collect, which will help get the van for Eve and other orphan girls like her. I hope so much you can help me with this project today! But let me back up (beep! beep! – sorry, couldn’t resist!) and explain. The story above about Eve is typical for the Bethany school for girls in Palestine. Sister Martha – I hope so much you watch my interview with her on YouTube! – is the head of the school and the unofficially adopted mother to the kids. Sister Martha is a nun. The 11 orphans – ages 5 to 19 are her adopted children from all over the world. Sister Martha, three sisters, and a few volunteers tenderly mother these orphans – giving them the loving care that every child deserves and desperately needs. 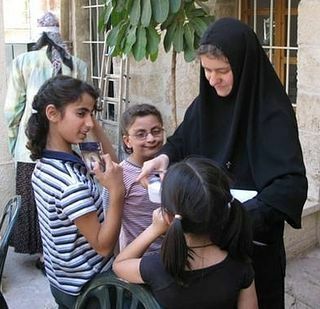 All the orphans are Orthodox – from different countries, including the USA. This school is a small epicenter of Orthodoxy which shines the light of our faith even on those who don’t care for our religion. And I hope that you can help them out! You tell me if this is an ordinary place – just look at what t I saw during my interview on Skype with Sister Martha. Our conversation was interrupted by Eve from the story above. She is now 12 years old and has had a happy healthy childhood at the school. But on the day of our conversation Eve felt terribly sad. We spoke in the evening, so Eve had already said her prayers, and went to bed, but her teddy bear could not comfort her. So she went to find Sister Martha, because she really really REALLY needed a hug. Eve was missing her mother who comes to visit only once or twice a year (Can you imagine?!). Eve didn’t realize Sister Martha was talking on Skype. She hugged her tightly and kept saying how much she loves her. And you could really tell the love was mutual. It was so powerful I could have almost touched it. I was afraid to breathe, afraid of intruding on this wonderful moment. It brought a lump to my throat. I am sure - being the caring person I know you to be – you would feel the same way. Sister Martha gave me permission to share this heartbreaking scene with you on our Facebook and YouTube channel after I’ve blurred Eve’s face. It needs to be done because Sister Martha has to fight for the safety of her charges’ souls and bodies daily. The girls are vulnerable in so many ways. The good news is: you and I can help them. Which brings me back to the van. As you know, there is almost constant instability in the Holy Land. Borders change frequently. For example, the school is in Bethany, Palestine, a predominantly Muslim area. St Mary Magdalene Convent of ROCOR, where the spiritual life of Bethany School centers around, is in Israel. But it is also in a mostly Muslim neighborhood. The distance between the two places is 3 km. It used to be a pleasant 30-minute walk. Today it’s a nerve-wracking 30-minute drive through a few checkpoints with armed soldiers. Some orphans are illegal in Palestine, others – in Israel. There’s not much that Sister Martha can do about this but try to keep them safe (which is a lot!). Good doctors, museums, shops, the beach, and other things necessary to someone caring for children are all in Israel. Public transportation – although available in Palestine – is unreliable and dangerous for young girls, who are at risk of being kidnapped and sold into marriage by Muslims to Muslims. But let’s go back to why I think I think you will be interested in this letter. The school’s current van is over 15 years old. It has over 250K miles on it. Today, Sister Martha has to get it fixed at great cost every couple of weeks. Without this van, the girls cannot go to church, see a doctor, or buy food. They need a new van now. I already have about $12K collected for the van. Sister Martha tells me there’s a local donor who will give another $25K, which is absolutely amazing! But I can’t do it without YOU. With your help, Sister Martha will be able to buy a gently used 9-seater van (even though they really need a 15-seater, but it’s just too expensive!). If you help me collect just another $12.5K, Sister Martha will be able to by the van they orphans need. If you send your donation now, you will have ensured safety and an excellent mode of transportation for a group of disadvantaged Orthodox girls. You will have fulfilled the commandment of Christ: “As you did it to one of the least of these, you did unto Me.” (Matthew 25:40). The benefits of your generosity are endless: in this world – for them, as well as the next – for you. Your gift will instantly improve life not just for Eve, but for all 11 orphans and their caretakers. That’s why I hope you can make a donation today. I know you are someone who cares for the less fortunate. You are also one of those people who go “above and beyond” to help members of our Church. These kids’ need for your kindness is two-fold: because they are orphans living in a dangerous place. And because they are your sisters in Christ Jesus. And your gift will have double the impact because we have a matching donor! You instantly double your donation just by making it! But hurry, our matching donor’s offer ends January 31. P.S. Please donate now to buy a van for Eve and other Orthodox orphans at the Bethany school for girls - and your gift will be matched! But only if you send it by January 31! P.P.S. When the girls are on an outing or pilgrimage – they go whenever they can being in the Holy Land – they will be praying for you by name. In gratitude for providing them with a safe method of transportation.